Karri Cormican and Emily Hodges talk about the Front Porch. This is The Gatekeepers, wherein we roam the City to meet the fine men and women standing between you and some of your favorite dining destinations. 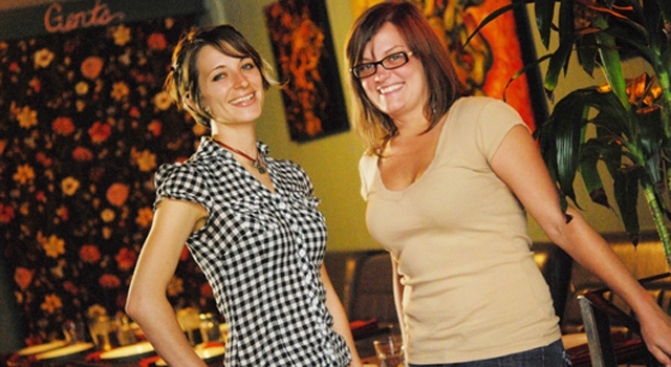 Karri Cormican and Emily Hodges, hostesses at the Front Porch: KC: There are about 50 seats, 14 tables plus a great bar. I’m partial to a cozy 2 top by the window that has home made curtains. 8 PM on a Saturday night. What’s the wait for a table? KC: At the busiest time we can have 1 ½ - 2 hours wait, but you can get a drink with some SF locals up the road at the 3300 Club, we call the bar when your table is ready. Is there anything I can say to make my wait shorter? EH: Nope. KC: No, never hurts to ask! But 8 on a Saturday in San Francisco, bring a sweater and hang on the front porch Ever been offered gifts or cash? EH: Yes. Some people don’t understand that someone else has been patiently waiting an hour for the booth that just opened up. They think I just need a little motivation to choose them, as if I’m picking my favorite person for each table that opens up. I’ve been offered cash, alcohol, show tickets, VIP status at other restaurants, flowers. Tell us about your favorite customers. EH: My favorite customers are the ones that come in looking for good food, nice service, and a chill experience. They’re the ones that like to hang out, the ones that come back because the Front Porch is like a community. They understand the whole context and don’t want the world to revolve around them. They love the food and will discuss the specials and what’s in season, enjoying the evening. Any celebs been by recently? Recent celebs have been Quentin Tarantino, David Cross, David Arquette. Al Gore came in when we first opened, and the one we got a big hoot over was Wayne from The Wonder Years. Like you mentioned, the Front Porch is a pretty small restaurant. How do you deal with VIPs when there are no tables left to give? EH: VIPs have to wait just like everybody else. Most have learned this, so they’ll reserve tables ahead of time to avoid the wait. The drop in VIPS know the drill and like to hang out, so they’ll just sit at the bar or on the porch and enjoy the experience. What’s the most outrageous request from a customer that you couldn’t accommodate? EH: A drop in party of 20 during the rush on Saturday night. What’s your favorite dish at the Front Porch? And what is the most popular dish? KC: They are one in the same, the fried chicken. I have dreams about that chicken! EH: The most popular dish is probably the fried chicken. The mac and cheese might take over soon. My favorite dish is the soft shell crab BLT that chef had on special last week. Where are you eating when you're not at The Front Porch? KC: I live and work in the Mission, there are so many great spots here. EH: At home. I love to cook. I spend a lot of time at the farmer’s markets munching on whatever I’ve just bought. If I go out it’s usually for oysters at Hog Island, or homemade noodles in Japantown. OK, obligatory question: how, if at all, has the down economy affected the restaurant and the way you do your job? EH: We haven’t gotten hit too hard, but we can feel it. People still come in but they buy fewer drinks and desserts. We still get rushed everyday, but it’s a little less intense. In your opinion, why has the Front Porch proven to be so popular? KC: Great food, comfortable atmosphere, and good people. EH: The Front Porch is a place for the mellow connoisseur. People that work here and people that come in here love good food and drink, and enjoy sharing that love with other people. This is reflected in the food and in the service. Any particularly fond memories from your time here? EH: I had a girl cry one time she was so happy with the food and service. What’s the one Gatekeeper tool you need to do your job? EH: Honestly, it’s a piece of paper to make a list, and the ability to be honest. People have told me time and time again that they appreciate my honesty. They know when they come in that the wait is no longer than what I say it is, that no one will sneak in ahead of them, that they will get treated with respect. KC: A good sense of humor, I’ll always be smiling!